Please be advised that there will be NO garbage collection for the Town of Trinity this coming Friday, April 19th due to the holiday. Garbage collection will be on Monday, April 22nd, and every Monday thereafter until further notice. ".....the best and largest harbour in all the Land." Trinity has been a viable North Atlantic community for hundreds of years. Its defensible harbour, with abundant room for the ships of the day and shores well suited for outbuildings, wharves and fish-flakes, made it ideal for the early migratory fishery. Later, merchants from Poole, England, made Trinity the base for a new-world fishery. During the 1720's Trinity was home to about 30 permanent families and host to 200-300 seasonal fishermen per year. By 1869, the population peaked at more than 800 people. Until recently, the inshore, Grand Bank and Labrador fisheries sustained the community. Lumbering, coopering, shipbuilding and other trades have been prominent. Historically, education was an important component of the community, with navigation and business education being taught at Trinity's Commercial School. Eventually, this school was merged with the grade school into a general High School. The teachers who taught in these schools included some of Newfoundland's leading educators and scholars. The preservation of Trinity's cultural and built heritage has made it perhaps the most notable "heritage community" in the province. Sustainable growth in existing and new businesses, including theatre, is clearly evident as Trinitarians, along with residents of the surrounding communities, play host to thousands of visitors per year. 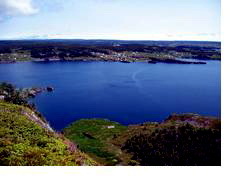 Trinity is centrally located and generally within an hour's drive of other points of interest on the Bonavista Peninsula. It is about 3 hours by road from the capital city, St. John's.